Blank Canvas Release Info & How You Can Help! So, yesterday I found out that Blank Canvas finally has a release date…and it’s next week! Yep! Blank Canvas will be available for your reading pleasure on Friday, June 19th. I’m super excited about the book being available (and I knew it would be coming out sometime this month), but one week has still made me – Eek! So, I’m getting as organized as I can as quickly as possible. 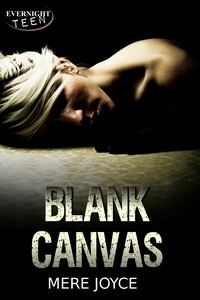 Evernight Teen will be hosting a blog tour for Blank Canvas sometime after it has been released. I’ll be posting more information on the tour when I have it, and I’ll post/tweet the links to each stop of the tour when they occur. I definitely encourage you to follow along…there should be some interesting posts, and there will be an Evernight Teen Gift Certificate up for grabs! I am also going to do my own thing the week after the launch day (starting June 21st) here on the blog, just for fun. I’ll have insights to my writing process, visual inspirations for the book, and more. Plus, this will also be the start of a second giveaway, this one for signed print copies of Blank Canvas! So stayed tuned for fun and festivities. Yes, my blogging friends, I would love for you to join me in celebrating the release of my debut novel! There are various ways you can help with the Blank Canvas launch, depending on your time/comfort/desire. Reviews – If you’re interested in getting a free e-copy of Blank Canvas for review purposes, let me know. I have copies I will happily gift to you, in exchange for honest reviews. If the book doesn’t sound like your cup of tea, or you just don’t have the time for reading/reviewing, I totally understand. But if you’d like a free copy for review, I’m happy to oblige, =) – Leave a comment below with your email address, or email me directly at merejoyce@hotmail.com! Book Release Blog Post – If you’d like to help out by posting about Blank Canvas on your blog, I’ve created a linky below. Sign up, and I’ll email you a cover photo, blurb, author bio, and excerpt. You can post as much or as little as you want, and you can post it whenever (doesn’t have to be on release day!) I’m happy to do an interview/character interview/top 10 list, etc. as well – if you’d like a more personal blog post, we can discuss the details through email. Book Tweet – I’ve started a HeadTalker campaign (if you don’t know what HeadTalker is, it’s just like ThunderClap – allows people to sign up to post a single tweet at a set given moment). Because I don’t have much time before release day, I’ve set what I hope is a manageable goal, which I’d love to surpass! Click here to join the HeadTalker campaign! Okay, I think that’s it for now! It’s going to be a busy week, but I’m so excited to share my story with you all, and I look forward to the upcoming festivities! Very exciting…. the cover is gorgeous. Thanks for visiting! Just signed up for the HeadTalkers. You must be excited!